Mills & Boon are proud to present a thrilling digital collection of all Sharon Kendrick's novels and novellas for us to celebrate the publication of her amazing 100th book! Many of these books are available as e books for the first time. Her boss...with amnesia! 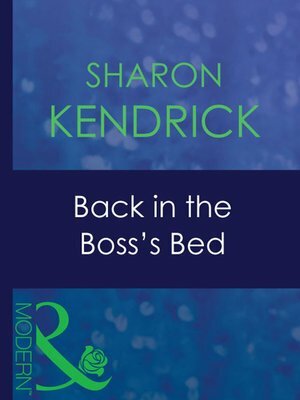 Kiloran Lacey is fumming when hotshot businessman Adam Black is hired as her boss – she's used to being in charge! Even worse, Adam is the most devastatingly attractive man she's ever met and it isn't long before he makes her his mistress. Then an accident leaves Adam with memory loss. Now he must depend on Kiloran to nurse him back to health. Their passion is as strong as ever and they both delight in the exquisite nights they share. But when his memories return will he still be able to let himself love her...?